Free Legendary for Each 110 Character!! Hey, I am posting this quickly as this is real, I just got it for all my 110 level characters, and I do not know if it is TIME LIMITED to July 24 2018?! There are 1000 Wakening Essences and a Mythic 2 Keystone waiting for your 110 toon in their class hall weekly Mythic chest! Since that chest disappears on looting and reappears at reset every Tuesday, I have no idea if it will still be there after reset this Tuesday July 24 2018, so go get it now!! The Mythic keystone does expire at reset Tuesday July 24 so use it quickly if you care. The 1000 essences go into currency so you can just go use them at your convenience at the vendor in the new Dalaran Blacksmithing shop to buy any specific non-crafted legendary of your choice for your class, or a random Bind on Account legendary token for any class that you can send to an alt. Apparently it is a gift from Blizzard to compensate for a bug on 8.0.1 release live, that killed loot from Mythic from previous week. Only a level 110 with class hall opened can get it, as otherwise the chest doesn’t show up for lower level characters. If like me you are not a Mythic player then chances are this great big chest has sat unopened and unlootable in the class hall for your alts since they hit level 110. If you don’t know where it is, wander around looking for the biggest treasure chest ever or check a guide on WowHead or Icy Veins or another fan site. Eg. for Mage it’s against the wall turn right as you enter from teleport landing. For Hunter it’s by the stairs that go up from the Missions board. 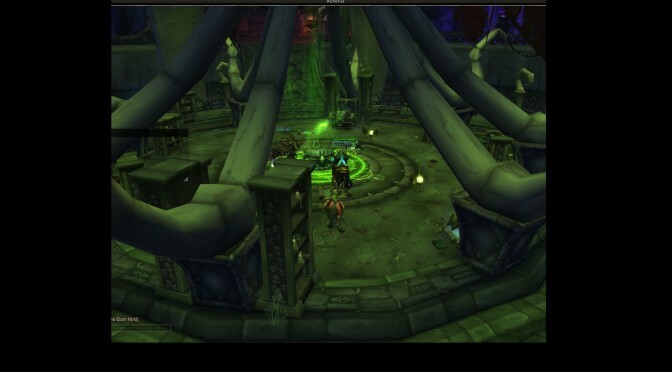 For Shaman it is left of the Missions Board, Paladin it is at the corner of the room/hallway near the Quartermaster. DK (picture at top of this post) it is visible on opposite side of Mission table from where you enter down stairs after teleport. Rogue is in Council of Shadows chamber on right beside first big candelabra. Druid is just right of Keeper Romulus (big quest giver) just across river from Missions Board. I have not read this anywhere other than on a couple of YouTube feeds, hats off to ITSSKITZ who dropped it inside one of his pre-BFA gold prep videos I was watching. Since then a couple of others have posted it on YouTube and it is on Reddit. I will post a video later of my alts running around grabbing theirs, got one boosted 110 left to do. Enjoy those legendaries, they keep their special traits through level 115, and if you choose well (is non-neck – sorry Prydaz – because of Heart of Azeroth new BFA neck mandatory legendary, uses non-heirloomable slot, is legendary with great stats and sockets) they may well last you non-Dungeon non-raiders beyond level 115 leveling. Previous PostLast Minute Tips on Mage TowerNext PostQuick Tip: WoW BFA Live: Train Your Gathering ASAP! !